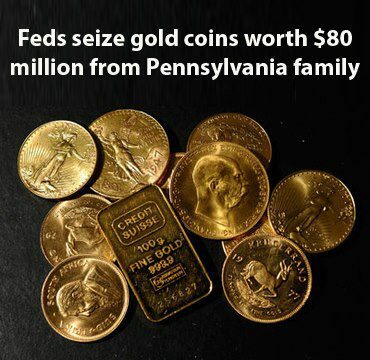 Feds seize gold coins worth $80 million from Pennsylvania family. A federal judge has upheld a verdict that strips a Pennsylvania family of their grandfather’s gold coins — worth an estimated $80 million — and has ordered ownership transferred to the US government. Judge Legrome Davis of the Eastern District Court of Pennsylvania affirmed a 2011 jury decision that a box of 1933 Saint-Gaudens double eagle coins discovered by the family of Israel Switt, a deceased dealer and collector, is the property of the United States. In the midst of the Great Depression, then-President Franklin Roosevelt ordered that America’s supply of double eagles manufactured at the Philadelphia Mint be destroyed and melted into gold bars. Of the 445,500 or so coins created, though, some managed to escape the kiln and ended up into the hands of collectors. In 2003, Switt’s family opened a safe deposit back that their grandfather kept, revealing 10 coins among that turned out to be among the world’s most valuable collectables in the currency realm today. 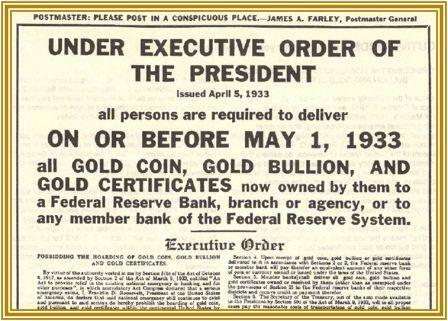 Executive Order 6102 is an Executive Order signed on April 5, 1933, by U.S. President Franklin D. Roosevelt “forbidding the Hoarding of Gold Coin, Gold Bullion, and Gold Certificates within the continental United States”. The order criminalized the possession of monetary gold by any individual, partnership, association or corporation. the government quickly took hold of the items and refused to relinquish the find to the family. The Langbords responded with a lawsuit that ended last year in a victory for the feds. Because the government ordered the destruction of their entire supply of coins decades earlier, the court found that Switt’s family was illegally in possession of the stash. Even though they may had been presented to the dealer by a Philadelphia Mint staffer, Judge Davis agrees with last year’s ruling that Mr. McCann broke the law. “The coins in question were not lawfully removed from the United States Mint,” the judge rules. Despite this decision, though, the attorney representing Switt’s family says the government has no right to remove their own items and transfer property back to the state. ← Democrats: Let’s Ban Profits!